Happy spring….errrrr….whatever it is. Today is March 25 and we had whiteout conditions for parts of the day. Nevertheless, I have some faith, due to thirty two years of walking this earth, that one day soon the sun will shine, the snow will melt, the crocuses and daffodils will force their way through the thawing ground, and it will be spring at last. And besides, Cooking Light Magazine told me it is spring. I thumbed through this month’s magazine, growing more and more excited about my favorite spring produce. 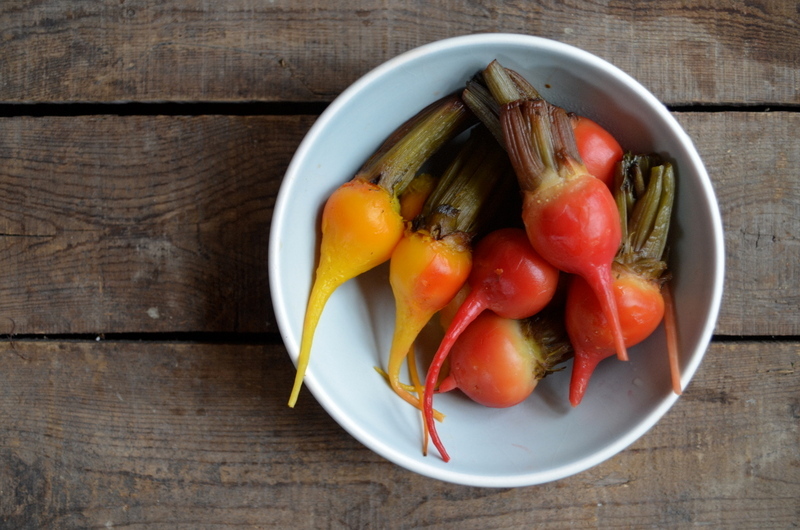 Fava beans, pea shoots, baby beets, radishes, asparagus…can’t wait! I especially love all of the baby vegetables you can get your hands on this time of year. They are so new and tender and just sing spring and fresh starts. 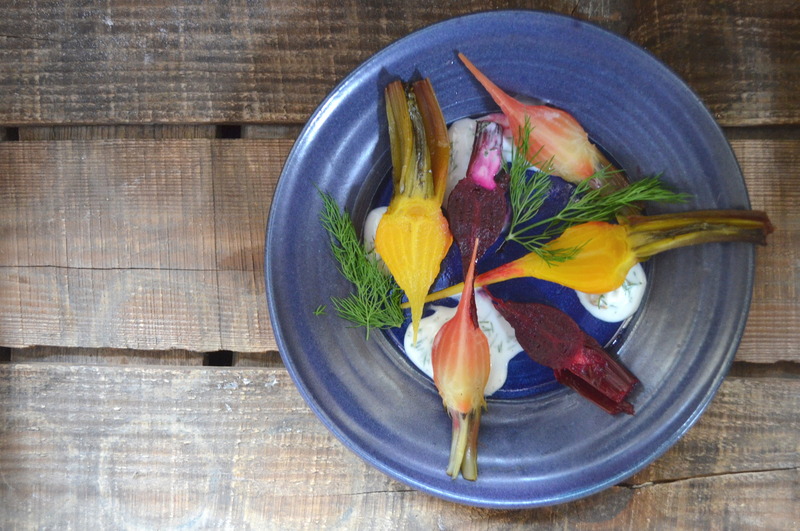 This roasted baby beet with creamy goat cheese dip recipe from this month’s Cooking Light issue felt so springy to me and was just what I was craving so in defiance of this weather, I whipped it up. First, scrub the beets and cut the greens off, leaving a one inch stem. 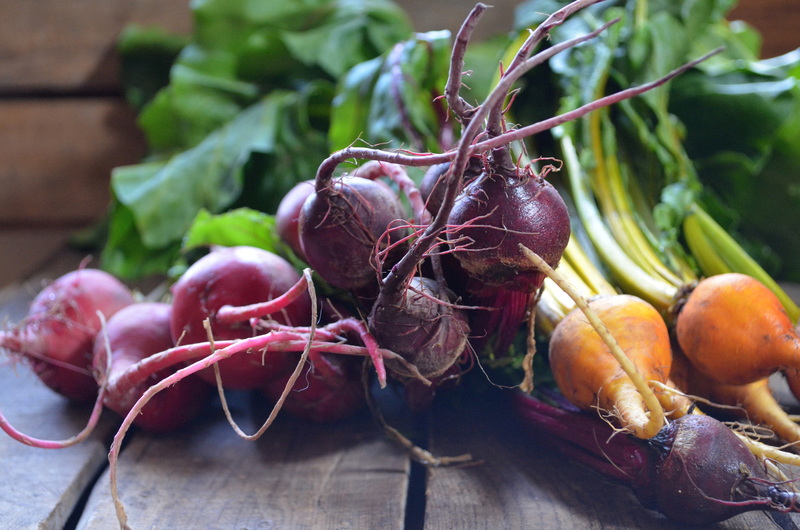 Don’t toss those beet greens! They are marvelous sauteed with some lemon juice, garlic, flaky sea salt, and crushed red pepper! Allow to cool and slip the skins off, taking care to avoid the stems, which can fall off if you are too rough with them. Blend roasted garlic from pan, buttermilk, dill, horseradish, lemon zest, salt, pepper, and goat cheese together to create sauce. 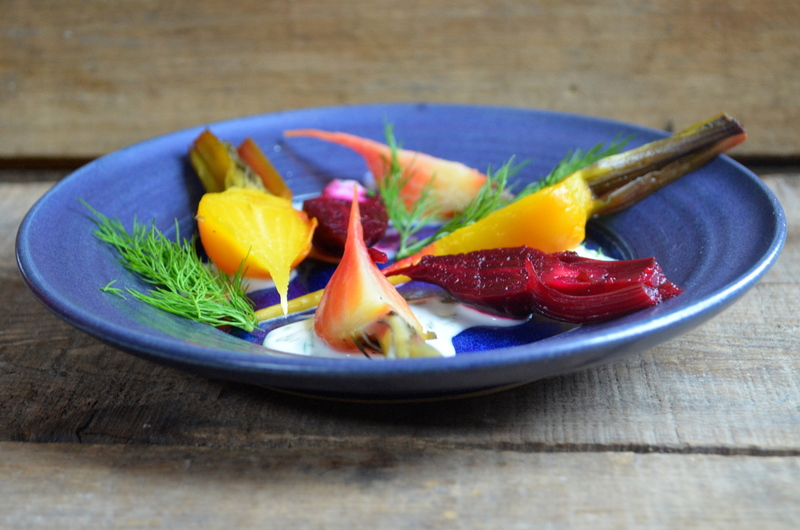 Artfully drizzle the goat cheese sauce on the plate, arrange beets on top, and enjoy! Rinse beets thoroughly. 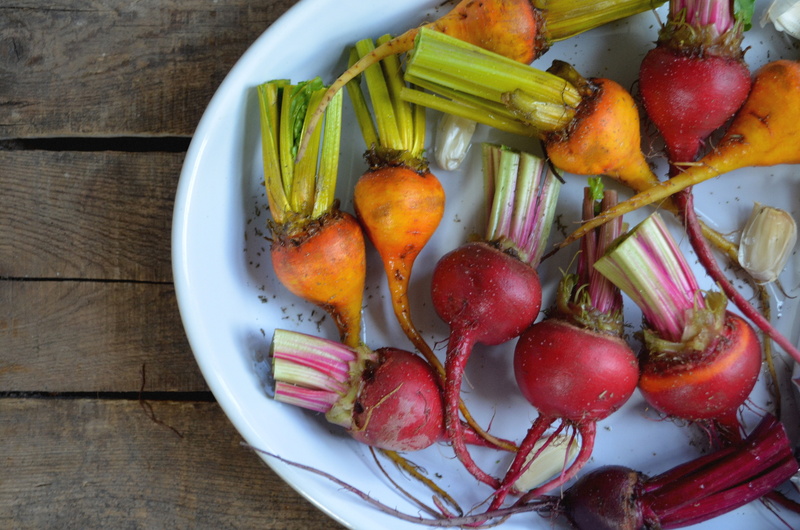 Leave 1-inch stem on beets; reserve greens for another use. 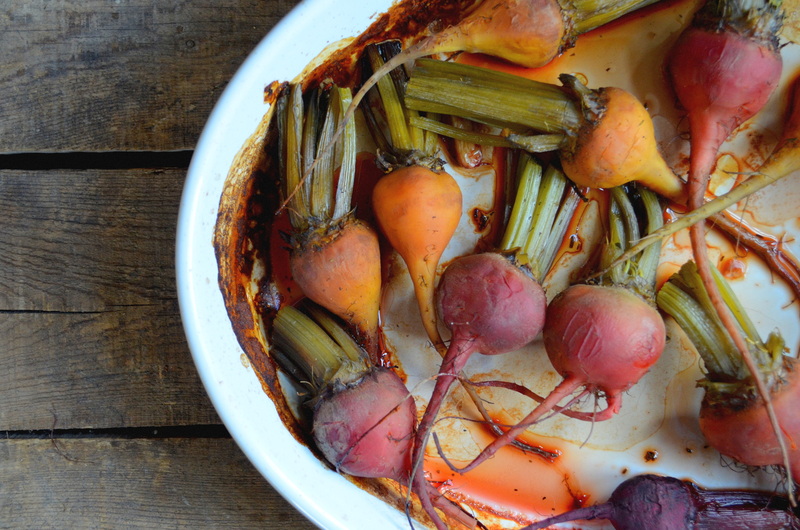 Arrange the beets, 1/4 cup water, garlic, and thyme in a 13 x 9-inch glass or ceramic baking dish. Cover with foil; bake at 400° for 1 hour or until tender. Uncover dish; cool completely. Reserve garlic and pan juices; discard thyme. Peel beets, keeping stems intact. 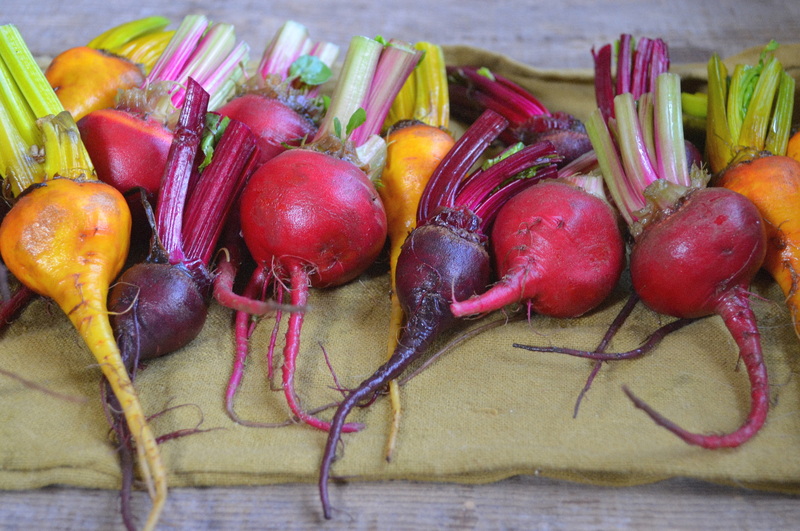 Cut beets lengthwise into quarters. Squeeze garlic pulp into a mini chopper; discard peels. Add buttermilk and next 6 ingredients (through goat cheese); process until smooth. Spoon 3 tablespoons sauce onto each of 6 plates; arrange 8 beet quarters over sauce. Drizzle 1/2 teaspoon pan juices over each serving; garnish with dill sprigs, if desired.